Over the weekend, Daddy took a bunch of pictures of me and tonight, we made this cool video. I hope you like it. For the past few nights, we've had a frog on our window by the family room. Those of you that have been to our house before know that this is two stories up. We had a neighborhood cookout the day before we headed to Iowa for the fair (but the pictures were on the little camera, which we just found!). It included a bike parade. It was completely chaotic, so the pictures are a little blurry, but it was fun! Even Ainsley's stroller was decorated! We just returned from our bi-annual visit to the Iowa State Fair. Here are the highlights. We started out in the pig barn. Then we went to the Avenue of the Breeds. Here is one of Mom and Ainsley along the Avenue. Then we saw the big bull. That bull was big. On our way to Little Hands on the Farm, we saw these pumpkins and had to have our photos taken with them. Hayden and Emmitt were also excited to make it to Little Hands on the Farm. Here we are, kicking off the process of burying our seeds to grow our crops. We picked carrots. Hayden kind of freaked out when the man tried to put the apron on her, so she cautiously watched from afar. On the other hand, Emmitt and Maisey had a great time. At the end, we turned everything in for our "dollar" and we bought snacks. There are a number of cut outs that we had our pictures taken with in years gone by, so we did it again.To see how we've grown, look here for 2007 and here for 2005. By this time of the day, we were getting hungry. Our first stop was the caramel apple stand. It was really good, but made a mess. 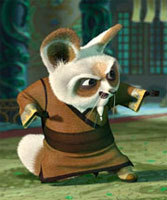 Cameron looked like Master Shifu from Kung Foo Panda. Our trip to the Varied Industries Building almost always means some type of Iowa State U souvenir (mini football helmets this year), as well as a visit with Clifford at the IPT booth. We also got to see Floyd of Rosedale at the U of Iowa booth. Outside, we visited with some soldiers from the Iowa Army National Guard and saw some of their armored carriers. Eventually, we caught back up with the Bierstedts. After lunch at the Iowa Turkey Federation stand, we headed to the Century Farm ceremony (with was the main purpose of our visit!). Here are the Reemtsmas up on stage, getting the Century Farm award. After the ceremony, we took lots of different family combo pictures. Here are the Reemtsma cousins. And here is Uncle Paul, Grandpa Walter's brother, and his family. Here is Grandma and Grandpa, Mom and our Aunt Michelle and Uncles Doug and Phil. Then it was our turn to ham it up. We're sure Hayden and Emmitt would have joined us, but they were out cold. Ainsley had to eat, so Mommy found a nursing station and Daddy took us to the giant slide. Ben is on the right. Cameron flew (literally!) solo the whole way down! We celebrated with root beer floats from the A&W stand before heading home! Here I am with Ruby at 1 month. Can you believe I'm already a month old? Here is a picture of the three of us, just hanging around. Maisey's christening was this weekend. Here are some photos from the events! This past week, I have been taking the hour bus ride to Camp Christmas Tree in Minnetrista with my neighbor, Wyatt. 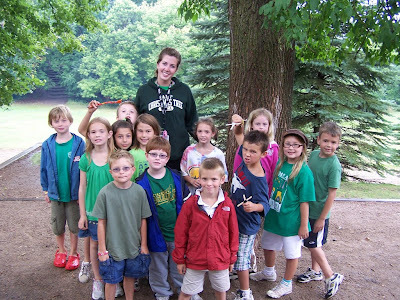 Here is my group with our counselor, Anne. On Thursday, Cameron and Daddy came out to family night to see what I was up to at camp (they had to ride a bus part of the way and there is no paved areas, so Mom and Ainsley stayed home). First, we went and visited my group's fort. Then, we ran down some trails. We stopped and visited some of the neat tree houses. And then we had lunch. Thankfully, Daddy brought Jimmy Johns for us. After dinner, we were back to running down trails. Dad convinced us to pause for a picture in front of the Camp Christmas tree sign. By then, we had run out of trails, so we took to the stairs down to the lake. We saw the swimming area, the fishing area and the canoeing area. Eventually, we found our way to the amphitheater, and we did our skit/song and went home.